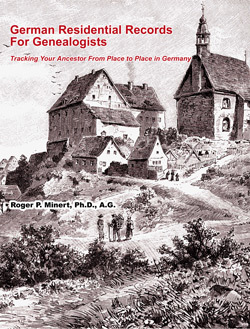 German Residential Records For Genealogists: Tracing Your Ancestor From Place to Place in Germany; Roger P. Minert, Ph.D., A.G.; 2018; Soft Cover; 193 pp; 8.5x11; ISBN: 978-1-62859-214-6; Item #: FR0652. The volume is also be available in a hard back edition. Sometime before the completion of Dr. Roger Minert's 2016 book, German Census Records, 1816-1916, he found himself studying one of the best examples of residential registration he had found in four decades of Germanic family history research. The page established for Theresia Baumgärtner, who arrived in Würzburg from München in 1889, is replete with details about her partner and their illegitimate children. Roger began to research the origins of the practice of documenting strangers and foreigners in Germany - finding that the practice was used all over Germany - and goes back for centuries in some areas. Thus this book, German Residential Records For Genealogists: Tracing Your Ancestor From Place to Place in Germany, was conceived. German residential records are found in archives all over Germany, and yes - many have been microfilmed and are available through the Family History Library. This book, German state by German state, details the history of these records. Tremendous numbers of these records were made, in that residential registration is a fact of life in Germany, an idea that's foreign to American researchers. The volume not only details the laws for each historic area of the Germany Empire, but includes examples, and state-by-state information on accessing these documents. Roger P. Minert is a Nebraska native with ancestry in Hannover, Baden, Sachsen-Provinz, and Württemberg. He received his doctoral degree from the Ohio State University in German language history and second language acquisition theory. He taught German language and history for ten years, and then became a professional family history researcher. Accredited by the Family History Library for research in Germany and Austria, he has more than 38,000 hours of research experience. In August 2003, Dr. Minert became a professor of family history at Brigham Young University. The author of more than 150 books and articles, he is currently directing the research project “German Immigrants in American Church Records” that has already resulted in 25 large hard-bound volumes under this title. His next publication will be a book entitled “Austrian Family History Research: Sources and Methods.” He and his wife Jeanne have four daughters and 21 grandchildren.